Oct. 26, 2010: Every hundred years or so, a solar storm comes along so potent it fills the skies of Earth with blood-red auroras, makes compass needles point in the wrong direction, and sends electric currents coursing through the planet's topsoil. The most famous such storm, the Carrington Event of 1859, actually shocked telegraph operators and set some of their offices on fire. A 2008 report by the National Academy of Sciences warns that if such a storm occurred today, we could experience widespread power blackouts with permanent damage to many key transformers. What's a utility operator to do? 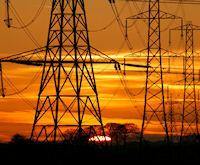 The sun rises behind high-voltage power lines in North America. A new NASA project called "Solar Shield" could help keep the lights on. "Solar Shield is a new and experimental forecasting system for the North American power grid," explains project leader Antti Pulkkinen, a Catholic University of America research associate working at NASA's Goddard Space Flight Center. "We believe we can zero in on specific transformers and predict which of them are going to be hit hardest by a space weather event." The troublemaker for power grids is the "GIC" – short for geomagnetically induced current. When a coronal mass ejection (a billion-ton solar storm cloud) hits Earth's magnetic field, the impact causes the field to shake and quiver. These magnetic vibrations induce currents almost everywhere, from Earth's upper atmosphere to the ground beneath our feet. Powerful GICs can overload circuits, trip breakers, and in extreme cases melt the windings of heavy-duty transformers. This actually happened in Quebec on March 13, 1989, when a geomagnetic storm much less severe than the Carrington Event knocked out power across the entire province for more than nine hours. The storm damaged transformers in Quebec, New Jersey, and Great Britain, and caused more than 200 power anomalies across the USA from the eastern seaboard to the Pacific Northwest. A similar series of "Halloween storms" in October 2003 triggered a regional blackout in southern Sweden and may have damaged transformers in South Africa. 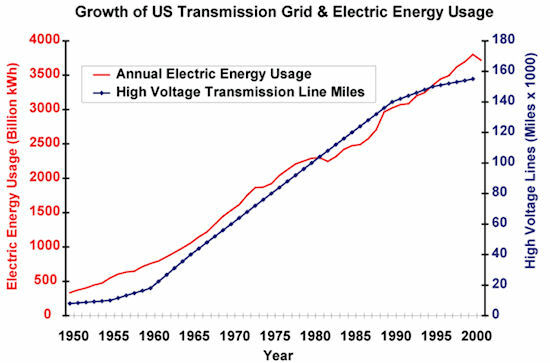 Growth of the High Voltage Transmission Network and annual electric energy usage in the United States over the past 50 years. Credit: North American Electric Reliability Corporation and the US Dept. of Energy. Since the beginning of the Space Age the total length of high-voltage power lines crisscrossing North America has increased nearly 10 fold. This has turned power grids into giant antennas for geomagnetically induced currents. With demand for power growing even faster than the grids themselves, modern networks are sprawling, interconnected, and stressed to the limit—a recipe for trouble, according to the National Academy of Sciences: "The scale and speed of problems that could occur on [these modern grids] have the potential to impact the power system in ways not previously experienced." A large-scale blackout could last a long time, mainly due to transformer damage. As the National Academy report notes, "these multi-ton apparatus cannot be repaired in the field, and if damaged in this manner they need to be replaced with new units which have lead times of 12 months or more." 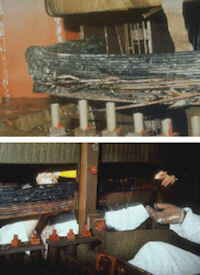 Permanent damage to the Salem New Jersey Nuclear Plant GSU Transformer caused by the March 13, 1989 geomagnetic storm. Photos courtesy of PSE&G. That is why a node-by-node forecast of geomagnetic currents is potentially so valuable. During extreme storms, engineers could safeguard the most endangered transformers by disconnecting them from the grid. That itself could cause a blackout, but only temporarily. Transformers protected in this way would be available again for normal operations when the storm is over. "Solar Shield springs into action when we see a coronal mass ejection (CME) billowing away from the sun. Images from SOHO and NASA's twin STEREO spacecraft show us the cloud from as many as three points of view, allowing us to make a 3D model of the CME, and predict when it will arrive." While the CME is crossing the sun-Earth divide, a trip that typically takes 24 to 48 hours, the Solar Shield team prepares to calculate ground currents. "We work at Goddard's Community Coordinated Modeling Center (CCMC)," says Pulkkinen. The CCMC is a place where leading researchers from around the world have gathered their best physics-based computer programs for modeling space weather events. The crucial moment comes about 30 minutes before impact when the cloud sweeps past ACE, a spacecraft stationed 1.5 million km upstream from Earth. Sensors onboard ACE make in situ measurements of the CME's speed, density, and magnetic field. These data are transmitted to Earth and the waiting Solar Shield team. "We quickly feed the data into CCMC computers," says Pulkkinen. "Our models predict fields and currents in Earth's upper atmosphere and propagate these currents down to the ground." With less than 30 minutes to go, Solar Shield can issue an alert to utilities with detailed information about GICs. Pulkkinen stresses that Solar Shield is experimental and has never been field-tested during a severe geomagnetic storm. A small number of utility companies have installed current monitors at key locations in the power grid to help the team check their predictions. So far, though, the sun has been mostly quiet with only a few relatively mild storms during the past year. The team needs more data. "We'd like more power companies to join our research effort," he adds. "The more data we can collect from the field, the faster we can test and improve Solar Shield." Power companies work with the team through EPRI, the Electric Power Research Institute. Of course a few good storms would help test the system, too. They're coming. The next solar maximum is expected around 2013, so it's only a matter of time. High-Impact, Low-Frequency Event Risk to the North American Bulk Power System -- A Jointly-Commissioned Summary Report of the North American Electric Reliability Corporation and the U.S. Department of Energy's November 2009 Workshop"